Raise money for your school, church or charity event! Master Silhouette artist, Cindi Harwood Rose, is available to cut paper portrait silhouettes for you, your loved ones, including children, spouses, and pets. Cindi Harwood Rose is available to appear in person at your charity fundraiser event! Cindi Rose can also help your fundraising efforts by mail. All that is required is to simply mail or email photos of the paper portraits you would like to Cindi. 1. Contact Cindi at CindiSilhouettes@gmail.com and let her know you would like to do a fundraiser. Please include the date and location of your event. 2. Send home the order form with each child, giving about 2 weeks for order forms to be filled out and returned with payment. Cindi will come to your school or church and cut silhouettes for those with order forms and payment ready. 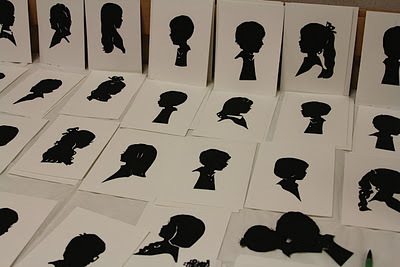 Children will pose for one minute for Cindi, and she will snip their silhouette portraits in a snap! Mail or email all order forms with coinciding right profile photos of each child wishing to have their portrait done. Be sure that each child’s photo is clearly identified. Cindi will then work from the photos, and mail back the silhouettes to you within 3-4 weeks time.